In late November of last year, everything felt like it was coming together perfectly for Sijara Eubanks. After entering the competition on Season 26 of The Ultimate Fighter ranked 12th in the 16-woman field to crown the inaugural women’s flyweight champion, the Brazilian jiu-jitsu black belt known as “SarJ” (pronounced “Sarge”) started working her way through the opposition. First she dispatched fifth seed Maia Stevenson, forcing her to tap to a kimura in the second round of their “Round of 16” encounter. She followed it up by knocking out DeAnna Bennett, connecting with a headkick out of nowhere that sent the former Invicta FC title challenger crashing to the canvas in the quarterfinal round. In the semis, Eubanks outworked women’s MMA pioneer and top-seeded Roxanne Modafferi to advance to the finals against fellow Cinderella story Nicco Montano, the 14th seed who beat the third seed, the sixth seed and the second seed to earn her place in the championship fight. But on the eve of her bout with Montano, everything came crashing down. Eubanks had issues during her weight cut and was taken to a local hospital. Her chance to compete in the inaugural women’s flyweight title fight disappeared and was awarded to Modaferri in her stead. The next evening, Montano capped her surprising run through the competition with a unanimous decision victory to claim the title. She laughs, probably in part because it’s the only thing she can do at this point. There is no going back and erasing the mistakes that led to her missing weight or an alternate timeline where she made the 125-pound mark without issue and stepped into the Octagon with Montano. She was a couple days away from fighting for UFC gold and it all came crashing down. And now she feels like DeSean Jackson. 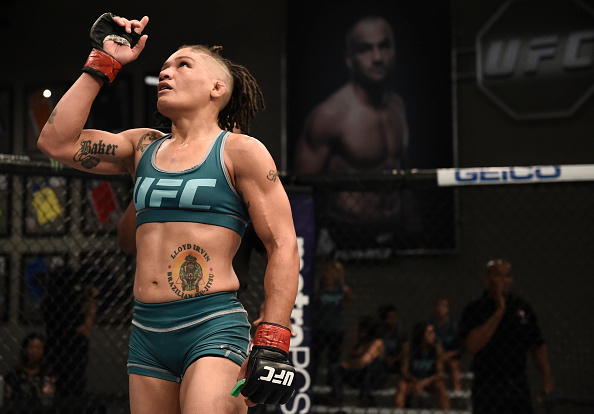 In addition to learning to laugh at the situation and focus on the future, Eubanks has made a handful of changes over the last six months that have her champing at the bit to step in the Octagon this Friday against fellow TUF 26 contestant Lauren Murphy. Following her miss in November, the 33-year-old spent time at the UFC Performance Institute working with Duncan French, Clint Wattenberg and Forrest Griffin to reshape everything about her diet, her conditioning and her overall preparation as a professional athlete. She also got an opportunity to get comfortable with her new team and stop being awestruck every time one of her famous teammates said “Hello” in the morning. “This is a brand-new team (for me). The last camp coming into the TUF Finale, I had just met them at the TUF house and spent eight weeks, 10 weeks working with them and it’s hard to get to know your coaches and bond with your coaches when you’re in camp. I’ve always wanted to be a champion. I’ve always wanted to be the best at what I do and I have lofty goals for my career and for myself personally. I’ve always known that I’m a beast. I’m a killer and now I’m in a room full of sharks and it feels like I belong. Fans of Season 26 may view Friday’s final preliminary card bout as a grudge match of sorts as Murphy has questioned Eubanks’ ability to make the flyweight limit multiple times during the competition and even hustled into the sauna in an attempt to make weight herself at one point when her upcoming opponent was struggling to shed her final pounds. But that’s not the way Eubanks is looking at this contest. Instead, she’s envisioning a chance to get right back into the thick of the chase in the UFC’s newest division; a showdown with a seasoned veteran and former Invicta FC champion who already has two UFC victories and five Octagon appearances under her belt. “I don’t like when people say it’s a grudge match because that happened almost a year ago, the whole beef,” she says. “For me, I think it’s a good fight. I think Lauren is experienced in the UFC and a win over her is going to be a good tick on my record, plus she’s ranked. More than anything, Eubanks sees her return his week as a chance to prove she can make weight, show everyone the improvements she’s made and get back to where she was at the end of November before everything went sideways – in position to challenge for the women’s flyweight title. “I’m a much better athlete, I’m much more disciplined, my much faster, stronger,” says Eubanks, who has remained in constant contact with the team at the Performance Institute throughout her training camp. “It’s just been an up and down experience. It was a real low I hit after being in the hospital and not even getting a chance to get to the scale. That was low, but to climb back has been an incredible journey and I’m really pumped. “It’s going to be fireworks,” she says of her fight with Murphy. “It’s going to be pure entertainment. I’m just really excited to show everything I’ve learned, how much I’ve improved.